On arrival, you will find private parking outside. Entering the villa there is the main air-conditioned living room with comfortable sofas in front of the satellite TV with a Netflix subscription and a DVD player. Custom artwork and traditional ornaments add a little colour and interest to the room. A large dining table provides the perfect spot for a quick mealtime. A bright, hugely spacious kitchen equipped with the whole Siemens range of facilities is available for your exclusive use, though our on-site chef will be happy to prepare your meals instead. Each elegant bedroom is located around your private swimming pool, giving you direct access and a gorgeous view. All five air-conditioned rooms have beautifully exposed timber ceilings and teak flooring, a fitted wardrobe, walk-in closet, and sublime ensuite facilities. There are two double rooms with king-size beds, two twin rooms with two super single beds each, and one room with both a king-size bed and two super single beds and even a sofa – perfect for those travelling with children. The fabulous master bedroom has a king-size bed, a satellite TV and DVD player and a writing desk. All five ensuite bathrooms have marble flooring, both indoor and open-air showers and come equipped with 100% cotton bathrobes and slippers and luxurious toiletries. In the exquisite garden the huge tree-lined, private swimming pool has excellent underwater lighting that genuinely makes it come alive by night, along with a poolside shower and pool towels. A traditional Thai Sala equipped with Bluetooth speakers and a cosy, casual seating area lies to one end of the pool. On the lawn, there are several sun loungers for catching a little sun and a gas-powered BBQ, perfect for spicing up meal times. Your opportunity to experience a little local culture, quality restaurants and family activities is just a short stroll away in the beautiful Mae Nam village. 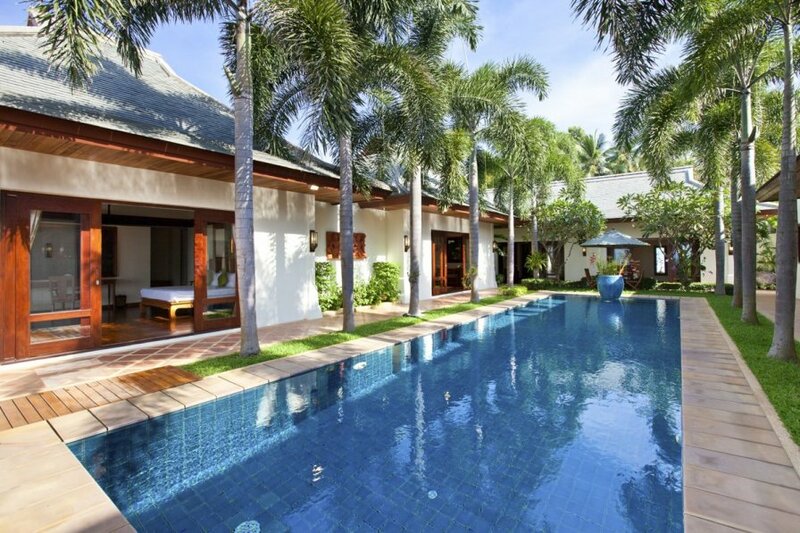 Villa Naiyana is located on the tranquil Mae Nam beach, a five-kilometre stretch of palm-lined, pristine white sand famous for its glorious sunsets.